Update #4: As predicted resetting the boot order didn't work: sudo efibootmgr -o 4,0,1,2 did nothing. Update #2: Might be because of HP's issue. Please see Rod's answer. This question remains unresolved. Update: I did Boot-Repair and it didn't work. See the bottom section for details. I just installed Ubuntu 16.04.2 LTS on a new 2017 HP EliteBook with a Ubuntu boot USB. I erased the Windows on it to just have Ubuntu. However the startup (see more info about the UEFI below) couldn't find an operating system unless I put the USB in. Then I tried a suggestion from this answer which gave the same error. 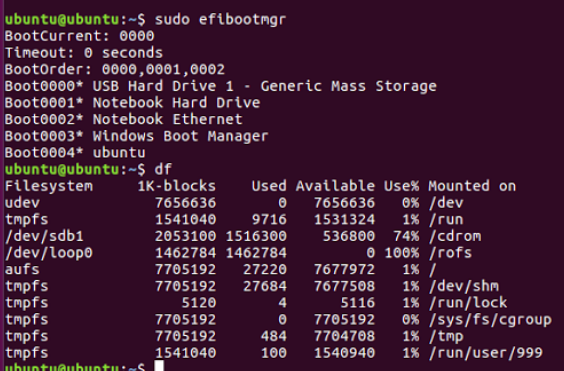 But I could not grep for boot in sudo fdisk -l.
Here are the results of sudo efibootmgr and df in Try Ubuntu with USB plugged in. Clearly I should change so that the boot order does not go to USB first and Ubuntu last. How do I move it up? 2a. Should I somehow change the SUB mount from /cdrom to /mnt? "You did find the exact same setup used on the install media -- the /cdrom/EFI/BOOT/BOOTx64.efi is actually a copy of shimx64.efi. This is how the install media boots using its default bootloader in UEFI mode. Rod Smith says in a comment "you must look into the hackish workaround of renaming your primary boot loader or boot manager file as EFI/BOOT/bootx64.efi". The vast majority of new computers today ship configured to boot in EFI mode by default. You can enable BIOS/CSM/legacy-mode support in the firmware, and some Ubuntu and Linux installation instructions recommend doing so; however, in most cases this is bad advice. See my page on the subject for information on why. It's unclear if you've made these changes yourself; the apparent presence of the BIOS-mode version of GRUB in your Ubuntu installation suggests you've installed in BIOS mode; however, the disk partitioning suggests you've installed in EFI mode. Use Boot Repair -- If you can get an Ubuntu emergency disk to boot in EFI mode, it should be able to re-install GRUB (in EFI mode) and you'll be good to go. The Boot Repair tool can do this semi-automatically; however, you must run it from an EFI-mode boot to be successful. If you switched to a BIOS-mode boot to work around problems booting the Ubuntu installation medium, you may need to re-create your Ubuntu installation medium or otherwise work around that boot problem first. See my page on the CSM, referenced earlier, for more on this subject. Use rEFInd -- You can boot the computer using the CD-R or USB flash drive version of my rEFInd boot manager. (Download links for both are on that page.) Once you've booted, you can install the rEFInd Debian package or PPA. You should then be able to reboot and use rEFInd, rather than GRUB, to control the boot process. Re-install Ubuntu -- If you reconfigure (if necessary) the firmware to boot in EFI mode and can get the installer to boot in that mode, re-installing Ubuntu is another option. This is overkill, but it may be easier than trying to fix your current installation, given that it's new. The Windows boot entry is still present there, too, which isn't surprising; however, the truly messed-up bit is the report that No BootOrder is set; firmware will attempt recovery. A working EFI relies on a variable called BootOrder to identify the order in which boot loaders will be run. This variable is absent on your computer. I've seen the same problem on a rather old HP 6470b laptop that I own, and no matter what I try, I've been unable to create this variable. In any event, the likely result is that the computer is trying to launch either the fallback boot loader (EFI/BOOT/bootx64.efi) or the Microsoft boot loader (EFI/Microsoft/Boot/bootmgfw.efi). If the boot loader launched is the original Microsoft boot loader, then it would flake out at this point because Windows is not installed. If you've copied something else to those files (knowingly or not), it might flake out if its support files aren't also present. Since you say your computer is new, my first recommendation is to return the computer to the store for a refund and buy something else. The problem may be a sample defect (a bad NVRAM chip or the like), or it could be a bug in HP's firmware. If the former, a new version of the same computer might work; but if it's buggy firmware, a new computer will do nothing. (OTOH, if it's buggy firmware, there's a slim chance that a firmware update will fix the problem. Resetting the firmware options to their defaults might also help.) If you return the computer to the store for a refund, be sure to tell HP you did that, and why. Manufacturers will continue selling defective products unless they're made aware of the fact that they're doing so, and they take some pain (in the form of returns) for doing so. If you refuse to get a non-broken computer, you must deal with it. The best way is to delete those Windows boot loader files from the ESP and to copy GRUB to the fallback filename of EFI/BOOT/bootx64.efi. (There's already a file in that location, but it's not clear if that's another copy of GRUB, another copy of the Windows boot loader, or something else.) You'll need to copy grub.cfg and perhaps other files from EFI/ubuntu to EFI/BOOT, too. If you use Boot Repair, there's an option on its Advanced page that will do this semi-automatically. On the hard disk -- The ESP on your hard disk is /dev/sda1, according to your Boot Repair output. This partition should be mounted at /boot/efi when you boot the Ubuntu on your hard disk; but when you use the Ubuntu installation medium in "try before installing" mode, it either won't be automatically mounted or it will be mounted somewhere else, in a subdirectory of /media, IIRC. On the installation medium -- It's not technically an ESP, but /dev/sdb1 on your installation medium serves the same role. It contains an EFI/BOOT directory with various boot files. Adjusting these files is pointless at best, at least in your case, because you want to get the system booting to the installed OS without using your installation medium. Note that typos (by me or by you) could make these commands fail to work as expected, and such a mistake could even make matters worse. If it works, this sequence of commands will copy Shim (which handles Secure Boot authentication) to the fallback filename of EFI/BOOT/bootx64.efi. Shim will then launch GRUB (grubx64.efi), which continues the boot process. If the efibootmgr -o command I presented earlier does not work, this sequence should get the system booting. It looks like boot-repair did add the ubuntu shimx64 boot entry as item 0004 in the last run of efibootmgr in your paste link. 0004 was missing in the earlier runs of efibootmgr (in your paste). Leading zeros are optional, but the above uses the entries as they are shown. sudo efibootmgr -b 0004 -l /EFI/ubuntu/bootmgfw.efi -L "Windows Boot Loader"
The rename is the file on the hard disk. Your df shows that the hard disk's EFI, sda1, is not mounted anywhere, so until you mount it, you cannot even see the /EFI directory which will appear where you mount it. Don't touch anything under the /cdrom directory. That should work (search this site for HP UEFI problems, but I think that summarizes the solution). That fallback bootloader may work independently of the nvram boot entry, and will keep your boot working if something decides to change the nvram boot list. Awhile ago, I had a dual boot, secure boot enabled host with ubuntu/shim as the first nvram entry, and after creating an install media on a USB stick, the shimx64 entry was changed to grubx64.efi (which of course will not successfully boot with secure boot enabled). UEFI has other more serious problems when USB install media are created, so I eventually changed my default system to run in legacy mode. What you found on the install media, the /cdrom/EFI/BOOT/BOOTx64.efi is actually the boot file for the USB. Don't alter it, since it works. Note that the BOOTx64.efi is just a copy of shimx64.efi. This is how the install media boots using its default bootloader in UEFI mode. This exact setup (well, case insensitive) is what you are putting on the hard disk as a fallback. If sudo mount /dev/sda1 /mnt fails because "it's already mounted" then use df to see where, but that's odd if you didn't do it. It's not the /cdrom/EFI, that's a directory (but another source for bootx64.efi and grubx64.efi to put onto the hard disk). Possibly, the disks were re-enumerated, and the hard disk became sdb, leaving the sda to USB. See what df says, and change the mount to /dev/sdb1 if that's the case. Not the answer you're looking for? Browse other questions tagged boot system-installation uefi hp boot-repair or ask your own question.